The Inter American University of Puerto Rico, Metro campus offers its prestigious Executive Master’s Degree in Business Administration (EMBA). The curriculum for the Executive Master’s Degree in Business Administration aims to provide a broad base and a solid preparation in management and the organization of business activities. We invite you to discover how Inter Metro could be part of your EMBA future. The Inter American University of Puerto Rico, Metro campus offers its prestigious Executive Master in Business Administration (EMBA). The curriculum for the Executive Master’s Degree in Business Administration aims to provide a broad base and a solid preparation in management and organization of business activities. In addition, the Program gives students an opportunity to specialize in one of the many functional areas of this discipline. The core courses required of all students stress the general principles and training applicable to all organizations. They cover a wide spectrum of disciplines such as decision theory, management processes, application of quantitative analysis to managerial problems, contributions of the behavioral sciences to functional areas of business management and relations of business organizations to socio-economic and political environments. Reference to special problems of business management, in areas like Puerto Rico and the Caribbean, is an additional objective. At the Inter Metro, you’ll learn how to leverage your strengths and discover new possibilities as you pave the unique path to the career of your dream. Skills: From your very first class, you’ll see how the Inter curriculum place you at an advantage. The one-semester Integrated Core provides an unprecedented breadth of cross-functional business knowledge, giving you the foundation to successfully pursue your personal career goals through your choice of major, minor or even a joint degree. Insight: You’ll share your major studies with your profesor that immerses you in your chosen field with hands-on projects and deep career insight. Along with Graduate Career Services from day one, your profesors will help achieve your goals during your internship and your career. Experience: Convert theory into practice and strengthen your leadership skills with real-world projects and international programs. Opportunity: Dream big—and grab it. The Inter Metro University team of faculty, staff, and alumni will help you achieve more than you thought possible. The Middle States Commission on Higher Education is the unit of the Middle States Association of Colleges and Schools that accredits degree-granting colleges and universities in the Middle States region, which includes Delaware, the District of Columbia, Maryland, New Jersey, New York, Pennsylvania, Puerto Rico, the U.S. Virgin Islands, and several locations internationally. The Inter American University of Puerto Rico was the first University in Puerto Rico to achieve this accreditation. The Consejo de Educación Superior de Puerto Rico (CES-PR) is the official agency of the Commonwealth of Puerto Rico that manage and administere higher education in Puerto Rico in accordance with the Commonwealth of Puerto Rico Law Number 17 of June 16, 1993. This agency periodical revise all the University programs in Puerto Rico to assure the maximum quality possible. This agency authorizes new academic program offers. The M.B.A. and all Inter American University of Puerto Rico programs are approved by this agency. El Consejo de Educación Superior de Puerto Rico (CES-PR) es una agencia gubernamental de Puerto Rico encargada de coordinar todos los esfuerzos relacionados a la educación superior. Fue creado por medio de la Ley Número 17 del 16 de junio de 1993. Entre sus funciones están la revisión periódica de las instituciones existentes y la autorización de nuevos ofrecimientos académicos. Todos los programas académicos de la Universidad Interamericana de Puerto Rico están aprobados por el Consejo de Educación Superior de Puerto Rico (CES-PR). The Network of International Business Schools (NIBS) is a group of business schools from around the world believe that the internationalization of business and the globalization of the economy are essential elements in the evolution of managerial practices. 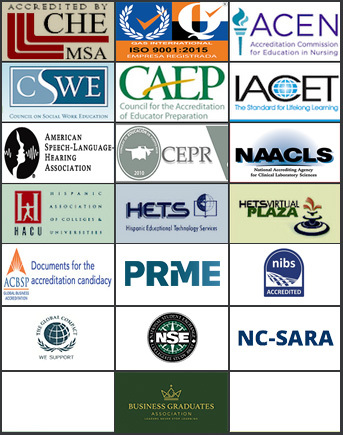 NIBS members believe that higher education and training must integrate a strong international dimension, including the practice of foreign languages, the study of comparative management techniques and the experience of working and studying abroad. NIBS Accreditation is focuse on the degree to which any business school has become international in all facets of its organization. The Inter American University of Puerto Rico Metro Campus and its Economic and Administrative Science Faculty were visit by the Accreditation Panel from April 22-23, 2010 “The Panel found the University to have achieved a very commendable level of internationalization, underpinned by support from faculty and motivation from students for its international aims and vision. This achievement is all the more impressive given the relatively modest economic, and socially deprived environment in which the University operates . After reflection and deliberation, the Panel unanimously agreed to recommend to the NIBS Board of Directors the Inter-American University of Puerto Rico, Metropolitan Campus shall be unconditionally awarded NIBS International Accreditation (effective 17 May 2010). The Panel believe the University delivers international study programmes in a truly inclusive and comprehensive way that genuinely celebrates and values diversity. Network of International Business Schools (NIBS). NIBS es una Organización que acredita el nivel de Internacionalización de Universidades y Escuelas de Negocios. La Universidad Interamericana de Puerto Rico , Recinto Metro y su Facultad de Ciencias Económicas y Administrativas recibió una visita de esta Organización el 22-24 de abril de 2010, el panel-visitante recomendó la acreditación de la Facultad de Ciencias Económicas y Administrativas y concluyó: “The Panel found the University to have achieved a very commendable level of internationalisation, underpinned by support from faculty and motivation from students for its international aims and vision. This achievement is all the more impressive given the relatively modest economic, and socially deprived environment in which the University operates. After reflection and deliberation, the Panel unanimously agreed to recommend to the NIBS Board of Directors the Inter-American University of Puerto Rico, Metropolitan Campus shall beunconditionally awarded NIBS International Accreditation (effective 17 May 2010). The Panel believe the University delivers international study programs in a truly inclusive and comprehensive way that genuinely celebrates and values diversity. APONTE VÁZQUEZ, JUAN B., Catedrático de Administración de Empresas. Ph.D. University of Pennsylvania. BENABE, LUIS, Catedrático Asociado de Administración de Empresas. B.S. Universidad de Puerto Rico; M.B.A. Rutgers The State University. Ph.D.(c) University of Pennsylvania. CASTILLO COLÓN VÍCTOR, Catedrático de Economía. B.A., M.P. Universidad de Puerto Rico; Ph.D. Doctor en Economía, Universidad Nacional Autónoma de México. COLÓN CORA, RAFAEL, Catedrático de Recursos Humanos. B.S., M.P.A. Universidad de Puerto Rico; Ph.D. Northwestern University. COLÓN TORRES, BALTAZARA, Catedrática de Economía. B.A. Universidad de Puerto Rico; M.A., Ph.D. Rutgers University. CUÉ GARCÍA, FELIX, Catedrático de Economía y Administración de Empresas. B.A.,M.A. Universidad Interamericana de Puerto Rico; Ph.D. Oklahoma State University. FLORES MARTÍNEZ, LUIS, Catedrático Asociado de Educación. B.A., M.S., J.D. Universidad Interamericana de Puerto Rico; Ph.D. Walden University. FREYRE, JORGE, Catedrático y Profesor Distinguido de Economía. M.A., Ph.D. Yale University; Doctor en Derecho, Universidad de La Habana. GARZA PONCE DE LEÓN, EDMUNDO, Catedrático Auxiliar de Finanzas. B.S.,M.B.A. Universidad de Puerto Rico. JUMAH, AHMAD, Catedrático de Finanzas y Contabilidad. M.B.A. Universidad Interamericana de Puerto Rico; Ph.D. Manchester Business School. LLORÉNS RIVERA, ANTONIO A., Catedrático Asociado de Economía. B.A., M.A. Universidad de Puerto Rico; Ph.D. The Ohio State University. MALDONADO MOLL OLGA, Catedrática de Sistemas de Oficina. B.B.S. Universidad de Puerto Rico; M.B.A. New York University; Ph.D. Argosy University. MARTÍNEZ CALIMANO, ENRIQUE., Catedrático Asociado en Negocios Internacionales y Contabilidad. B.B.A.Universidad de Puerto Rico; M.B.A. Universidad Metropolitana; D.B.A. Argosy University, Florida. MILÁN OLIVIERI, ARLINE, Catedrática de Recursos Humanos. B.A. Universidad de Puerto Rico; M.A. Universidad Interamericana de Puerto Rico; M.A. New York University; Ph.D. Walden University. PADRÓ RIVERA, JOSÉ R, Catedrático de Matemáticas. B.S. Universidad de Puerto Rico; M.A. Ohio State University; Ph. D. Saint Louis University. RIVAS MORALES, ANA MARÍA, Catedrática Asociada de Relaciones Laborales. B.A., M.P.A. Universidad de Puerto Rico. RIVERA DE MÁRQUEZ, ELBA, Catedrática de Educación Comercial.B.S. City University of New York; Universidad Interamericana de Puerto Rico; Ph.D. New YorkUniversity. RIVERA RODRÍGUEZ, ÁNGEL, Catedrático Asociado de Economía. B.A. Universidad de Puerto Rico; M.A. Harvard University. RUIZ MERCADO, ÁNGEL L., Catedrático de Economía. B.A. Universidad de Puerto Rico; M.A. Universidad de California en Berkeley; Ph.D. Universidad de Gales. VIVES AMENGUAL, EVANGELINA, Catedrática de Contabilidad. B.B.A. Universidad de Puerto Rico; M.B.A., Ph.D. New York University; J.D. Brooklyn Law School.